SAN ANTONIO—AAHOA this year at its annual conference isn’t being shy about its record-breaking achievements over the past year. 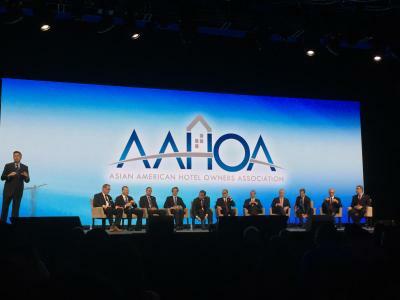 With more than 6,500 attendees and vendors on hand at AAHOA’s annual convention, the hotel owners association—celebrating its 28th year—is larger than it’s ever been—reaching more than 16,650 members in 2016. The group’s lifetime memberships increased more than 27% during the same time period (there are now more than 3,000 lifetime members within the association). The schedule at the four-day conference—being held here this week at the Henry B. Gonzalez Convention Center—is packed with several general sessions encompassing discussions with industry leaders and analysts; educational sessions focusing on increasing revenue with social media, preparing for the future of franchising, preventing HR lawsuits and financing projects; and opportunities to network and conduct business with vendors and peers. Offering attendees a collection of hotel products and services, the trade show at this year’s event has more than 400 exhibitors (600 booths in total—an event record) spread out across a showroom floor of more than 62,000 sq. ft. Additionally, AAHOA’s PAC raised more than $1 million this past election cycle—more money raised in a single election cycle than all years prior combined (AAHOA formed the PAC in 1997). A total of 35 donors individually contributed the maximum $5,000 donation allowed by law to the federal PAC. Some of the contributors named are David Kong, CEO of Best Western; Wyndham CEO Geoff Ballotti; Hyatt CEO Mark Hoplamazian; and Choice Hotels CEO Stephen P. Joyce. Made up of CEOs from 11 hospitality groups, a panel, moderated by Chip Rogers, president and CEO of AAHOA, discussed a range of topics: using technology to interact with customers; accommodating the millennial generation; balancing brand mandates and the interests of owners; and the growing intrusion of government on the industry. While adopting new technology enables properties to interact with users, Hoplamazian recognized the importance of advancing technology while also not replacing personal touch. Technology shouldn’t take away from the experience (for example, a technology platform limiting the personal touch when a front desk clerk checks in a guest). The focus should be more on how technology can elevate human interaction, not replace it. Not surprisingly, the topic of technology brought the industry’s strong focus on millennials into the conversation. RLHC CEO Greg Mount initiated the talking point during his explanation of how his hospitality company is accommodating this group and the rest of its guests with technology: by giving them options. Joyce took a stab at a question on how brands can work more closely with owners on brand mandates. “We don’t make decisions around investment that don’t include ROI,” he said. Speaking on customer demand, he noted that there’s a difference between a small group of customers wanting something and an overwhelming majority of customers demanding it. He even took it a step further by going back to the previous topic, pointing out that “millennials are not a model.” For instance, there are some who have mortgages and others who are still living at home. Eric Danziger, CEO of Trump Hotels, spoke on the importance of location. Some brand mandates may not make sense at a particular property due to its clientele. With regard to Washington impacting the industry, Kong noted how “crucially important” it is for everyone in the industry to become involved, pointing to several policy implementations over the years that have negatively impacted hospitality and lodging. Without support and funding, groups like AAHOA and AHLA cannot effectively lobby on the industry’s behalf, he said.